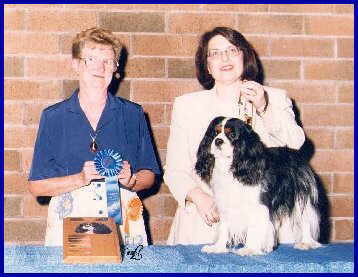 Graham winning Best Tricolor in Show under noted breeder judge Sylvia Lymer at The Cavaliers of the West Show, Beaverton, Oregon in 1998. Graham was a regal and polite boy. He had the important job of managing all the other Loch Lomond Cavaliers and he took this responsibility very seriously. He kindly educated all the youngsters that have came into his kingdom. A king he was! 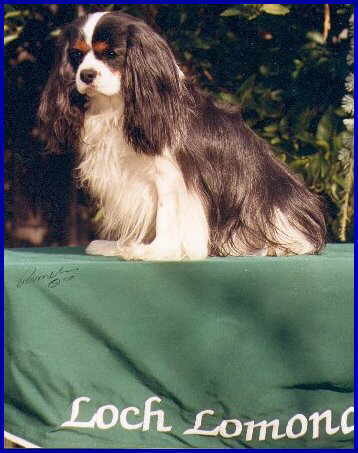 Graham was the grandson of CKCSC-USA /CKC CH Laughing Charisma, 1992 National Specialty Winner and sire of many champions including Best of Breed Winner at the 1997 Westminster Kennel Club Dog Show, AKC/CKCSC-USA CH Partridge Wood Laughing Misdemeanour. We are proud to report that Graham was"heart clear' at 12+ years of age and was listed in The Health Registry.